When you're cooking for a bunch of guys, it can be challenging to have them eat vegetables, even more so on Superbowl Sunday. But if you tempt them with a flavorful and colorful salad, it just might find a way on their plate! I added this Chopped Salad to our Mediterranean inspired Superbowl menu and it definitely will be something I make again. The salad was a nice burst of freshness to the meal and not complicated at all to put together. I normally don't cook with chickpeas very often but really liked the texture it added to this salad. 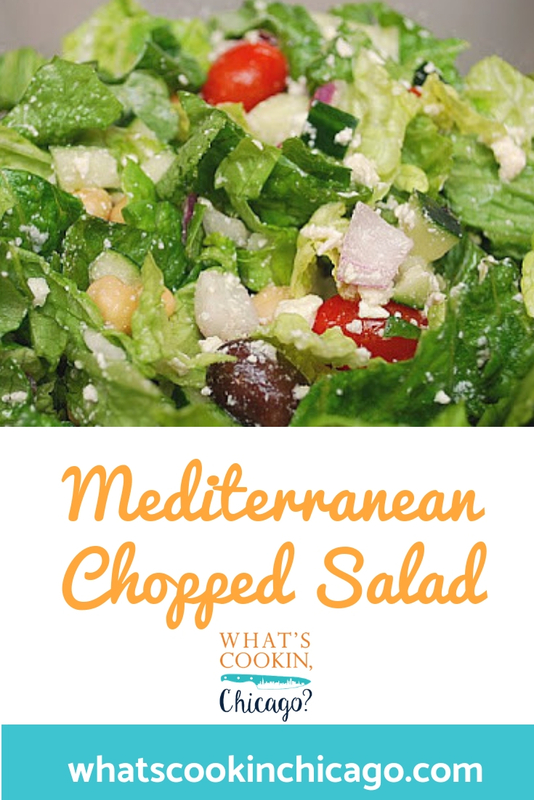 Paired with olives, red onion, feta, and the simple red wine vinaigrette, the bright flavors of the Mediterranean came through! The addition of grilled chicken or even steak or lamb would be a great way to make this salad a meal. I definitely plan on making this again during the spring and summer months for a nice burst of freshness and color. Combine all the salad ingredients in a bowl and toss. Whisk oil, vinegar, and garlic in a bowl. Season with salt and pepper to taste. Pour over salad ingredients and toss to coat. Let the salad stand for 5 minutes for flavors to meld before serving. Yum! I miss eating feta! (you didn't eat it, did you?) I don't know where you find all the time and energy to prepare so many varieties of food! I'm so sick of the same pregnancy/diabetic approved dishes!